The "Word...of the Month" kits are wooden letter sets themed according to each month of the year. Each month will have one to two words to choose from. All pieces will be cut from MDF and fonts and sizing will vary. They will be available as finished or unfinished kits. This set is cut from 1/2 inch MDF. 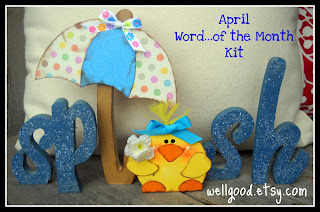 The letters are 3 to 5 inches tall, the umbrella stands 7 inches tall, and the little chick is 3 inches tall. This kit comes unfinished, with all letter pieces (s,p,s,h), L/umbrella handle and top, and chick cutout, paper detail patterns, and finishing instructions. These letters are cut from 1/2 inch MDF and vary from 4 to 8 inches tall. 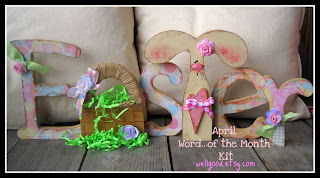 The kit contains letters E,s,e,r, A/basket cutout, T/rabbit cutout, and heart cutout. Paper detail patterns and finishing instructions. This kit arrives unfinished and sells for $12. feathers, eye tacks, and finishing instructions. March Kit #1 is a fun and cheery reminder of the change of seasons, the warm that is coming, and the beauty that will soon surround us! 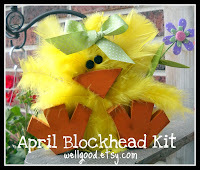 This set is cut from 1/2 inch MDF, letters stand 3-5 inches tall, bird stretches up 7 inches. Kit contains all letters, bird and wing cutout, base, legs, craft wire, flower paper and center, paper to cover bird, and patterns for flower, and finishing directions.